Clear and coloured glass with painted details and silver stain. Given by E.E. Cook Esquire. The Book of Tobias recounts the story of the pious aged Tobit and how his son, Tobias, with the aid of the archangel Raphael, was able to restore his father's health and wealth. The archangel Raphael, in disguise, leads Tobias to the lands of his kinsman Raguel. Raguel gives his daughter Sara in marriage to Tobias but warns him that Sara's seven previous husbands had all been devoured by demons on the wedding night. With Raphael's aid, Tobias prepares a potion, the smell of which drives the demons out. He and Sara are able then to successfully consummate their marriage. The dog sleeping on their bed belonged to Tobias and accompanied him and Raphael on their journey. 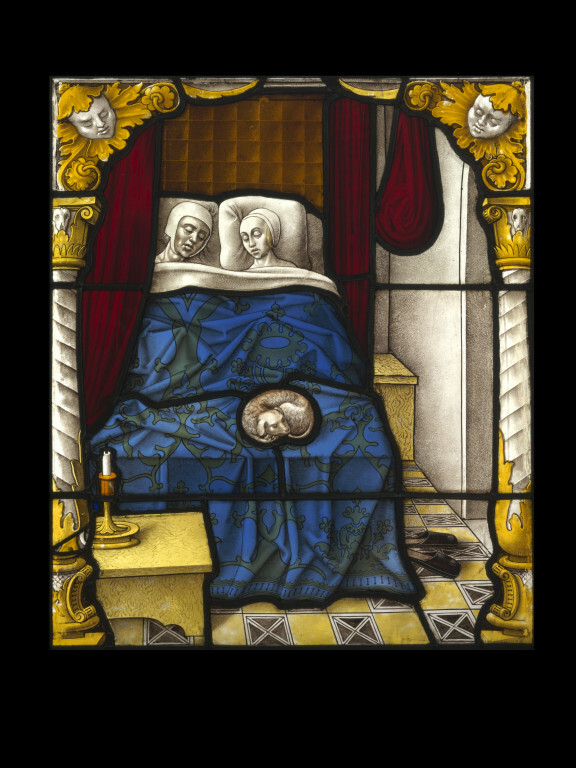 In this context he may also symbolise marital love and fidelity. 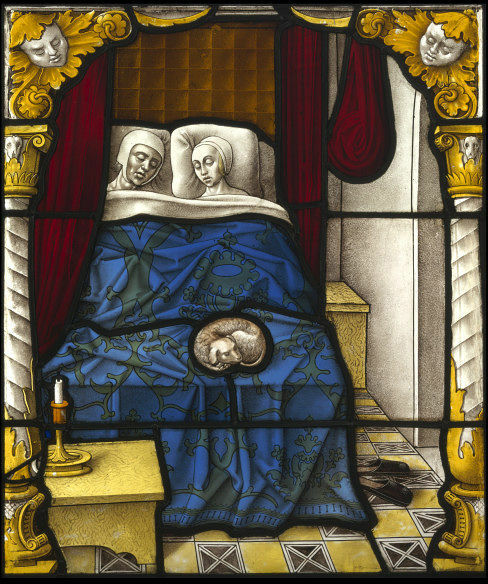 Stained glass panel depicting Tobias and Sara in bed. 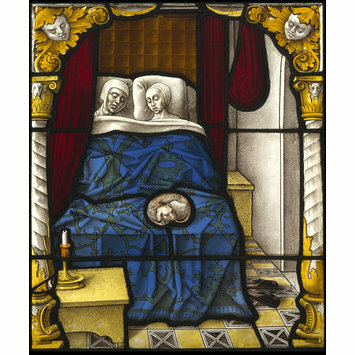 Tobias and Sara are executed in clear glass with painted details in brown pigment. They lie sleeping, with night caps on, in their bed which is covered with a deep blue brocaded bed spread. Behind them is a red curtain. On their bed is a small dog asleep. A table with a candlestick and candle is in the front left of the panel and a single pair of heeless shoes lie on the floor to the right. The whole scene is framed in renaissance-style spiral columns and a round arch. These and the flooring, alternating yellow and black squares (the latter with white saltire crosses) are executed in silver stain and brown pigment on clear glass. The size of the panel suggests that it originally belonged to a narrative programme in a cloister, perhaps typological, and it probably came from one of the numerous cloisters in Cologne secularised in 1802. The Renaissance decoration of the architectural surround, especially the putti heads in the spandrels, can be matched exactly in glass in Cologne Cathedral, possibly originally from the cloister of the Cistercian abbey of St Apern in Cologne. The Book of Tobias (or Tobit) is considered by the Catholic Church to be a canonical book of the Old Testament; its historicity was confirmed at the Council of Trent in 1546. The reformers in the emerging Protestant churches in the first half of the 16th century considered it to be non-historical and thus non-authoritative. It was removed from the official new Bibles and labelled as 'Apocryphal'. Foister, Susan, Art of Light: German Renaissance Stained Glass(London: National Gallery Company, 2007), 32 p., ill., ISBN 978 185709 348 3.